and many other places of your choice and liking. 2011-04-18 - The official video for the song "Bergtagen" is now online! The track is taken from the upcoming album "Irrbloss" and was first viewed on the release party on Saturday April 16. This is the first YGGDRASIL-video ever recorded and we hope you like it. Enjoy! In other news, YGGDRASIL has signed to Northwind Promotion for the booking for a European tour later in the year. A release party for the new YGGDRASIL album will be held at Distortion Rock Club in Malmö, Sweden on April 16th. The pre-party for specially invited only will feature a pre-screening of the new YGGDRASIL video for the song "Bergtagen". The doors will open for the public at 23:00. Hope to see you there! Today Uppåkra is a small town in southern Sweden but it was once one of the greatest cities in northern Europe. Archeological findings in recent years have proved Uppåkra to be one of the oldest and most long-lived cities in northern Europe, dating back to the 1st century BCE and surviving as a great centre of commerce until the 11th century CE. On the new album "Irrbloss" YGGDRASIL pay tribute to this old town, where the band's guitarist/vocalist Magnus Wohlfart was born, with the song "Uppåkra". In return Uppåkra's Archeological Centre supports YGGDRASIL by making the song "Uppåkra" available for free download on their website. Head over to www.uppakra.se to download the new YGGDRASIL track and learn more about this historical town! 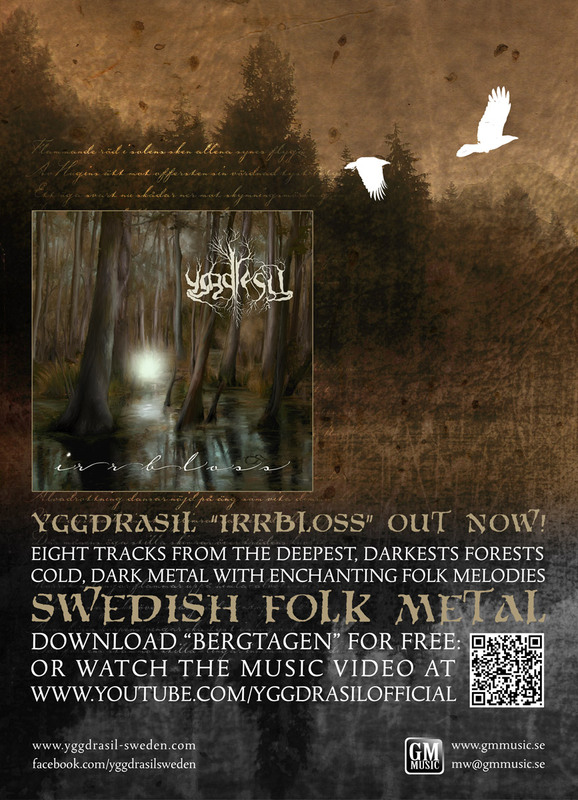 2011-04-07 - The new YGGDRASIL-album "Irrbloss" can now be pre-ordered here: www.gmmusic.se/yggdrasil. All pre-orders come with a free poster signed by the band! Head over there to listen to yet another new track from the new album.